Weber’s Q120 features 189 square-inches of cooking space across a porcelain enameled grill-rack that retains heat better than stainless-steel or aluminum for superior non-stick and searing abilities. The 8,500 BTU stainless-steel burners are fired by an electronic ignition system for easy lighting whatever the weather, and are fuelled by 14.1 ounce or 16.4 ounce replaceable liquid propane canisters. A built-in thermometer means you can adjust your cooking temperature precisely, and two folding work tables give you additional food preparation space. A removable drip pan makes cleaning a breeze, and lowers the risk of firebox fires. Its compact dimensions make this unit is highly portable and should serve well for impromptu cookouts. This one comes with all the cooking prowess of a large grill, but with the distinct advantages of a smaller footprint and greater portability. The 21,700 BTU stainless-steel burners are designed to heat up to your desired cooking temperature quickly, and also provide added protection against the water found in liquid propane. A 393 square-inch porcelain enameled cast iron cooking grate provides enough heat retention to sear your food efficiently, and also offers enough space to cook for a large gathering of family or friends. A built-in lid thermometer ensures that you will always be cooking at the correct temperature, and a removable drip pan makes cleaning this unit a simple task. 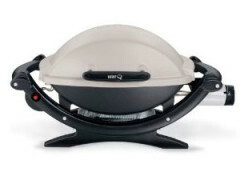 It boasts a push button ignition system for easy lighting, and adjustable 8,500 BTU burners for maximum cooking heat. The unit runs on 14.1 ounce or 16.4 ounce liquid propane cylinders. The unit is lightweight and fully portable, and features a removable drip pan, 189 square-inch porcelain enameled cast iron grill-rack for searing your steaks or chicken breasts to perfection, and a glass reinforced nylon frame to increase durability and longevity. Constructed from durable cast aluminum, this unit is designed to be hardwearing and is finished in a titanium-color painted finish. The unit comes complete with a five-year limited warranty. The latest portable design of this Traeger grill is the answer for easy handling when going outdoors for a picnic, camping, and tailgating. With its compact and handy design, you can bring it with you wherever you go without the hassle. 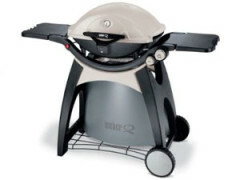 It also comes with great features such as the 3-speed controller and a grilling surface area of 169 square inches. 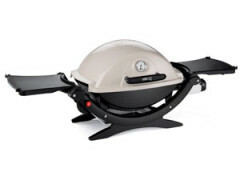 The estimated weight of this griller is 40 pounds and it has an option to be upgraded to a digital controller which is specifically prepared for this grill. This grill gives you 155 sq. inches of cooking area. It makes use of either bottles of disposable propane, or even it may be turned to a complete twenty pound tank or perhaps natural gas. 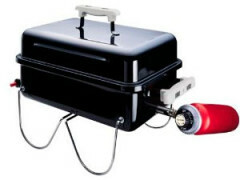 It is an easily transportable infrared barbeque grill with electronic push-button ignition. Also, it features V-shape stainless-steel grilling grids that enhance the taste of your food while minimizing flare-ups; it also has a bag for carrying. 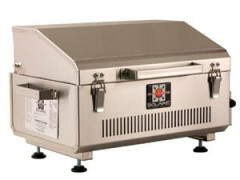 Its advanced burner offers you the high heat to trap the juices to give you more delicious meals. If you wish to bring with you a handy yet flexible burner that could serve the purpose in your camping needs then the Coleman 2-burner grill is just right for you. You can expect a durable piece that is too easy to clean and maintain. With its adjustable burners and large control knobs it will surely give you the comfort and ease of using this piece of device. Aside from that, you can rely on this grill stove in both hot and cold weathers at different altitudes. Once you purchase one for yourself, you will be able to avail of the Limited Lifetime Warranty that goes with the package. Enjoy the comfort, effectiveness, efficiency, and flexibility of the this portable grill from Coleman as you go for an exciting outdoor getaway. It might be you will be having a road trip, camping or picnic with your family and loved ones. 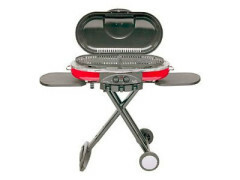 This grill is designed with a full-size grill supported with foldable legs for easy transport and storage. It contains two burners which cooks food especially meats equally. The cooking space of 285 square inches allows you to cook and grill enough for a small group of individuals. 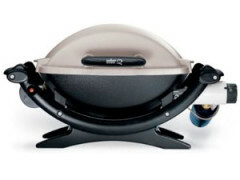 The griller comes with individual control knobs which allow you to control the temperatures of each burner. This griller is great and flexible to use. Taking a road trip with your family and friends is an exciting getaway. You need to prepare a lot of stuff and that includes a grill set to cook your food. 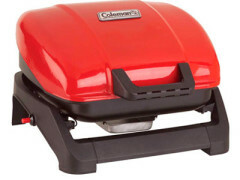 The Coleman 9940-A55 Roadtrip Party Grill is just perfect for the whole outdoor activity. It is portable and you can be very sure that your food will be cooked at its best quickly. You don’t need to worry about starting the whole thing since it is matchless and at the same time you can save from its fuel use. What makes it more versatile is that the party grill can be used in different weathers either hot or cold and altitudes as well. If you are fond of having picnics or tailgating at sport events then this Coleman grill is just the perfect choice for you. 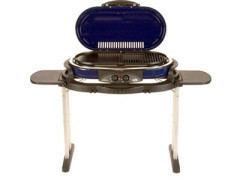 This propane grill is very handy since it is collapsible and it also includes detachable side tables. It comes with a cooking surface, a grill, griddle, and stove. 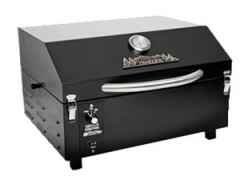 With its fully adjustable burners it will surely give you the comfort and ease of controlling the whole grill. 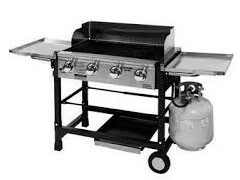 It is also very efficient and effective to use since the griller goes with a disposable 16.4-ounce propane cylinder. Aside from all these, you will have a 5-year limited warranty when you get one for yourself. 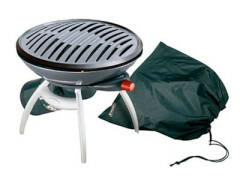 If you are into outdoor cooking, then this Coleman Roadtrip Table Top Grill is right one for you. You can simply do your cooking and grilling jobs with ease of comfort when you make use of this piece. It comes with great and versatile features that will surely be of big help to you. It is made of stainless steel and you will enjoy its InstaStart feature, also known as matchless lighting. It also comes with a grease management system, built-in temperature gauge, and a warming rack. It is portable and compact which is easy to transport and store.